I think Delenn was trying to save face for him. But it would have been kinder in the long run for her to just say "look bub, ain't never gonna happen so get over it!" to him. End of the world kind of feeling, I knew bad stuff was coming, Keepers and all, and I just wanted to put it off. So I watched National Treasure 2 instead. Feelgood action, no deep feelings, no being invested in some fictional characters, actually *caring* what happens to them. Today: bull by the horns. And he looks *so* unhappy that no one could help feeling sorry for him. 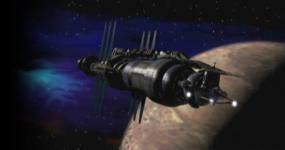 Delenn sees the darkness surrounding him, and he is now completely alone. What a horrible feeling! The thing is.... he isn't completely alone. Never, ever during the rest of his life will he enjoy the luxury of being able to be completely alone. And that is the ultimate horror. Yes, Londo and G'Kar's discussion was very moving. However, for me even more touching was that pretty much immediately after seeing his world being bombed, the first thing Londo does is to try and save G'Kar. Words of friendship are easy. Deeds of friendship - that's the real thing. Isn't it strange, G'Kar? When we first met I had no power and all the choices I could ever want. And now I have all the power I could ever want and no choices at all. No choice at all. I kind of liked the Delenn+Lennier scene. I love you followed by I know cannot but remind someone like me (SW fan) of Han Solo, but it was such a nice scene I didn't have the heart to giggle. And even though I thought Delenn rather overtalked the aftermath (really, couldn't she have left it at "I actually didn't hear anything"....), I still think she did a fair job of it. Also, this was the second scene ever where I thought Lennier was hot Believe you me, during seasons 1-4 I couldn't imagine thinking that!